Mens Military Rings are designed and engraved to commemorate a period in the United States Military. For many men it is one of the great symbols of military service. It is instantly recognizable. 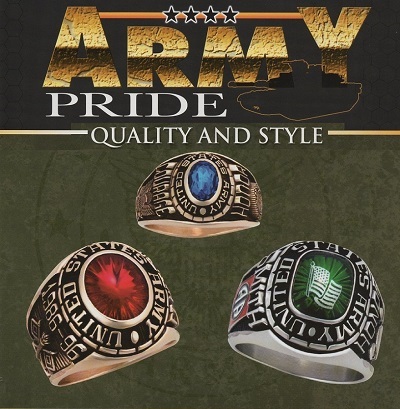 Mens military rings are worn as symbols of our dedicated soldiers, airmen, marines. Also the sailors who are dedicating their lives in the service of their country. Traditionally, military rings were only worn by men. This is because soldiering as a profession is reserved the male. Rings are long considered a status symbol by royalties and aristocrats. The rings they wore often depict the family crest or the coat of arms for the particular royal line. This practice was applied to nobility who enter the military service as officers. Rings that contain the insignias of the branch of the military they belong became popular. This tradition continued in the military and has been adopted even in the common members of the armed services. This is particularly true in the army branch during the colonial period, extending to the World War conflicts. The Army branch, traditionally the biggest branch of the military also carried this tradition from the officers and even to the lower ranks. These army rings for men became popular as symbols of their service and sacrifice to defend their country. In the United States, the cadets and graduates of the prestigious United States Military Academy started to develop the practice of wearing their class rings in the year 1835. Since then, the practice was carried on to the different military schools and installations. Today, the military has more specialized branches such as the Air Force, Navy, Coast Guard and the Marines in addition to the Army branch. These developments are also reflected in the increased customization of the military rings. 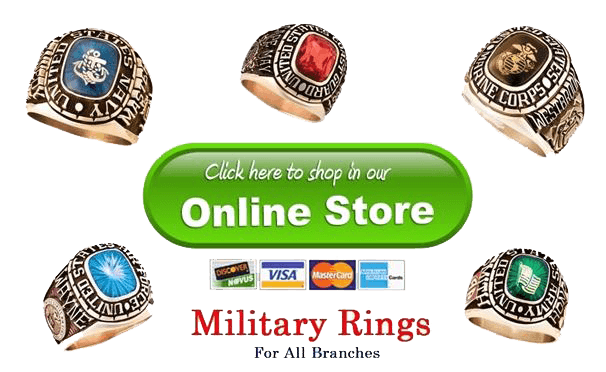 Military school rings, service rings, campaign and deployment rings and even promotion and combat award rings are available for servicemen and officers. The mens military rings, as well as those for women are not just bought to celebrate the services, the milestones and the achievements that these heroes have made in their military career. These rings are reminders of the experience and friendships that they made during their service. The military rings are also are a symbol of the sacrifices that they made not just personally but also those made by their family in support of their duty. These rings are also often given by their loved ones as a token of their support and love. They are a sign of, courage, and symbol of dedication to duty. To ensure that this symbol of loyalty, sacrifice and dedication can last as long as these courageous soldiers and to enable them to pass on this heirloom to their family, these rings must be made to the highest standard of quality and craftsmanship that is deserved. Balfour military rings offer the highest quality and craftsmanship. The experienced and dedicated designers that they have offer an extensive collection of customized rings that are available. Balfour’s cutting-edge crafting technology provides for very intricate, precise and personalized details that can be rendered in the ring. This results in a symbol that properly represents the traditions, experiences and commitment of these brave guardians of peace and freedom for the citizens.